Did you know that Bernie Sanders is all but assured of a contested Democratic convention? 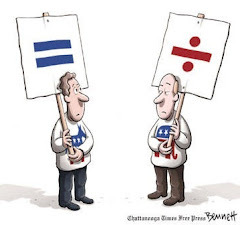 The Bernie Bots tell us so by a startlingly naive application of simple math. One example is embodied in a picture post that the senator's fans have been passing around and sharing. Its most basic claim is that “In order to prevent a contested convention with Bernie Sanders, Hillary needs to win 65% or more of the vote in every future state.” While I agree that Sanders has enjoyed a remarkable degree of success in the campaign to this point, the supposed reversal of fortune for Clinton seems a bit of a stretch. And it is. The New York Times keeps a running tally of the delegates in each candidate's camp. As of today, the Times reports that Clinton has 1,307 pledged delegates and 469 unpledged delegates for a total of 1,776 (a nice patriotic number). Sanders by contrast has 1,087 pledged delegates and 31 unpledged delegates for a total of 1,118. The successful candidate will need 2,383 delegate votes to secure the Democratic nomination for president. Thus it's a simple matter to determine that Clinton needs 2,383 − 1,776 = 607 more delegates while Sanders needs 2,383 − 1,087 = 1,296. Per the Times, there are evidently 1,959 delegates up for grabs in future primary elections and caucuses. Therefore, Clinton must secure 607/1,959 = 0.310 = 31% of the remaining delegates while Sanders has the more formidable task of rounding up 1,296/1,959 = 0.662 = 66.2% of them. How can the Bernie-Bot picture post be so wrong? Easy! First, assume that all unpledged delegates (the notorious “superdelegates”) are undecided free agents. After complaining bitterly for months that superdelegates are Clinton minions who have “rigged” the nomination contest, Bernie's supporters are now pretending they can be ignored and omitted from Clinton's delegate count. If one insists that the 1,307 formally pledged delegates are all she has, then she needs 2,383 − 1,307 = 1,076. That's a whopping 1,076/1,959 = 0.549 = 54.9%. 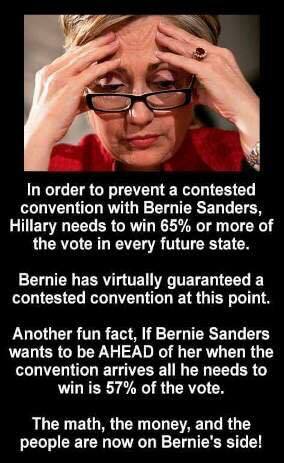 That's not as dramatic as the Bernie-Bot claim that she needs 65%, but it would still indicate that Hillary needs a majority of outstanding delegates to win the nomination! She's at a disadvantage! Or so we can pretend. Remember how shocked Mitt Romney was when he lost the election in 2012? He and his campaign team had been taking all too seriously the “corrected” polling data from partisans who insisted that professional pollsters had biased their population samples against the Republican nominee. If you assumed that there would be a lot more GOP voters at the polls than the national pollsters were finding in their sampling, the results for Mitt were great! But wrong. The power of an unwarranted assumption is great. And it gets even greater when you can't do the math.